Considering a set of Baker air wings, the 2 piece type that mount on each side of the fairing. I understand they adjust outward or inward, to direct wind toward you or shield you. If anyone has used bakers, I would be interested in hearing your experiences with the air wings, and how the rear passenger is effected, if at all. Also, will they effect the wind noise in the helmets ? I dont have the stacked ones but I do have the lowers. work fair for me. Direct some cold away, direct cool in as needed. I have reversed them on the bike to get the farther out in summer time. The wife hadnt ever said one way or the other, I hve the larger different ones on my 1500. The bakers are from ventureline and are on my royal. I dont think there are much differences between brands. On the 1500 I also have the small winglets under the mirrors, and a slipstreamer windshield. Wife complained about the winds in all configurations, so its hard to give general impressions. I had air wings on my 1500. upper and lowers. Loved them. Worked great in summer by deflecting that 122*F heat off my hands and legs. same in the winter, kept that cold air off my hands and legs. If it was just ordinary hot, they would curl a real nice breeze in behind that big windscreen I had (29" tall). That's what my bike looked like before that Freightliner rolled it up into a ball last year. Before you ask "where's the protective gear", it is in mom's house. Just took her around the block a bit at a nice slow leisurely pace. She's out in a rural area and no traffic to bother us. Look like hell, but work very well. I have a love/hate relationship with them, don't like their looks but sure like what they do both winter and summer. For the 1500 get the ones with the two sections. I have had a set on my 1800 for about 4yrs and I find them excellent. On a hot day the lowers car be turned easily whilst on the moveto deflect cool air onto your legs. The top ones have a little square section that can be opened to again deflect cool air inwards. 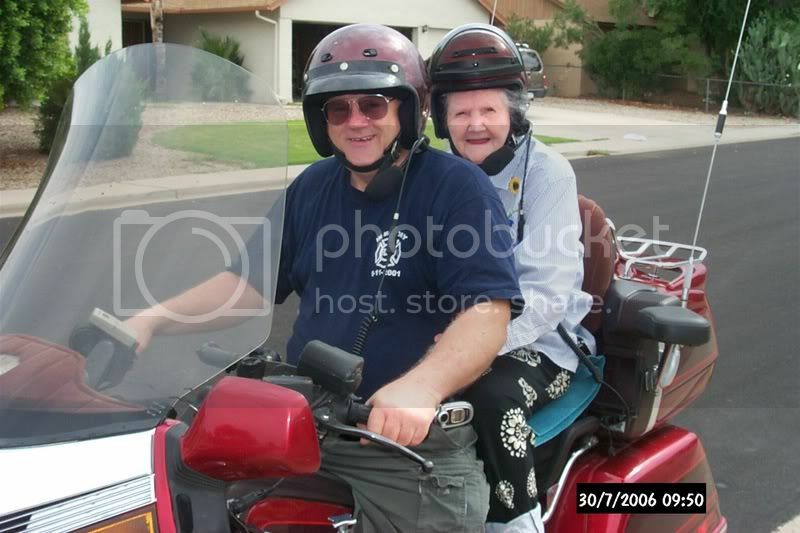 The pillion has little advantage from this. On a cold wet day they widen the area of protection from the fairing helping to keep you and your pillion dry. I have coloured matched ones which I think help the look of the bike. Expensive but a good buy that I have had absolutely no problems with so far. Only criticism I would have is that they are fitted with shinney chrome nuts when new that after a while tend to rust and look unsightly. I am at the point of replacing mine with stainless steel nuts and bolts.This is the only photo of mine I have. I'm considering getting a set for my 1100. But I read that you have to drill into the right side of the fairing to mount them on an 1100. I'm not to keen on the idea of that. I have them on my 1500, they work great for directing wind but work excellent in the rain. Close the vent in the windshiels and close the baker wings, if it's not a torrential downpour and as long as you don't have to stop I find I don't get soaked. 1998 GL1500SE in Pearl White. I had Baker wings on my '82 CB900, moved them to my '84 Aspy, the difference is huge. It really does make riding in summer heat tolerable. I think you should also look at JC Whitney, they make a model similar to the Baker, but not quite as pricey. You can't go wrong either way. I have the standard Bakers, plus the upper and lower additions, but I haven't intalled the upper/lowers yet. I have the sort that Little John has on his and are pictured and to be frank I think they are rubbish and if they hadn't come with the bike, I would be very displeased had I spent out the money to buy them. One of the main reasons that I say this is because I had just the lower ones on my 1500 (not Baker I would add) and they were superb, just as Exavid says, not elegant, but they make a huge difference to keeping air off and also to bring it in when turned around. The ones fitted to my 1800 do virtually nothing to stop any drafts or bring it in to cool me, in comparison. If I were starting afresh, I would go with the Baker ones that are similar to the ones seen on the 1500 and earlier and don't waste your money on the ones that follow the lines of the fairing. And as Little John says the nuts and bolts rust quickly and I have had to change to staineless now.